One of the most famous verses in the Bible used in the field of apologetics is 1 Peter 3:15, “But in your hearts honor Christ the Lord as holy, always being prepared to make a defense to anyone who asks you for a reason for the hope that is in you; yet do it with gentleness and respect” (ESV). In apologetics when a person “defends” the faith of Christianity it’s easy to get “defensive” when arguing with someone of another opinion. 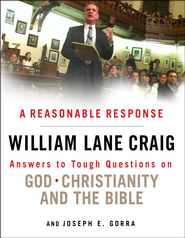 The beauty of this book is that Craig and Gorra are able to give the finest evidences for the Christian faith and answer the biggest objections to Christianity and do so while “speaking the truth in love” (Eph. 4:15). Craig and Gorra are not only a gifted apologists, but loving evangelists and truly demonstrate how the gospel can be the center piece of all evidence with reference to offensive evidences as well as defending attacks on the Christian faith.